Just catching up on some fashion news and it seems that the "it bag" is no longer the bag to have. Now what you want is the utility bag. Harriet Walker in her article “Why those in the know are no longer in with the It Bag“, says that the it bag has now been replaced by the utility bag. According to her Independent News article, "such a bag is likely to be quiet, casual, anonymous and – of course – staggeringly expensive”. The utility bag can be anything from a “simple plastic shopping bag”, a ruck sack, gym bag whose only attribute is that it is associated with a designer label and was shown on the catwalk. So style, fashion and overt label when it comes to bags is now replaced by practical, purposeful and no label with the only remaining characteristic being astounding prices. Can you believe that it bag - the designer handbag that you simply had to have with the overt designer label is now firmly out of fashion? What do they mean no labels? What's the prestige in that for label lovers? So how then can you spot that elusive designer made utility bag. Price is a sure indicator. But you have to wonder when next buying your utility bag – is it genuine designer bag or a knock off? So pay special attention to your fashion news and what’s on the catwalk. Buying designer fashion ia always tempting but do be careful that you don't end up like Rebecca Bloomwood (played by Isla Lang Fisher) in “Confessions of a Shopaholic” running up enormous credit card bills outfitting herself in the latest Louis Vuitton top, Vivienne Westwood skirt , Miu Miu pumps and Judith Leiber belts to name a few fashion designers and all for the sake of fashion. She later sadly realizes that in many instances she was buying labels and not necessarily quality. That movie gives new meaning to the term follow fashion. Whatever happened to uniqueness and individuality over renown designer labels and buying quality unique handbags and handmade bags from talented artisans? When people ask you where did you get that you know that you are doing something right don't you? That's why my utility bag this summer is no other than this 70’s inspired, colourful and versatile barrel bag well made by Where from 100% cotton. This shoulder bag is a stylish and funky bag for all occasions. 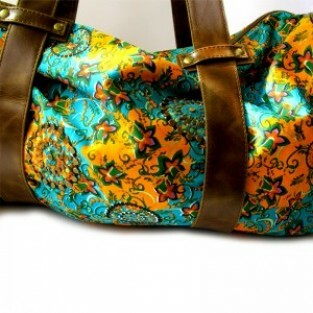 – yoga, gym, shopping, carry on, and best of all as a beach bag for the summer. With handles, zipper and side trim all made from leather, I know that quality is built-in and that it does not cost the earth at £30.